Click Here to Return to Prototype Product and Catalogue Page! These are specialized antennas for OEMs only and are custom designed to meet OEM's requirements. These antennas incorporate my basic Quantum Coherence Attractor technology, and are available in several sizes, ranges and power levels. Normally, all critical components are sealed in a specially-treated epoxy potting compound with two leads for signal input extending from potted assembly, although unpotted versions are available as well, the effect will be weaker. Potted size usually 3" x 4.5" x 4". Exact size will vary across prototypes. 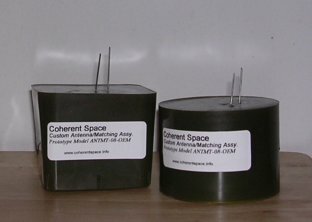 Entire antenna assembly (both potted and unpotted versions) has been treated after production with a special treatment field. Any and all effects of the device should be relatively permanent, or for at least 30 years. Please contact us for pricing, terms and availability, and for info on full technology disclosure.